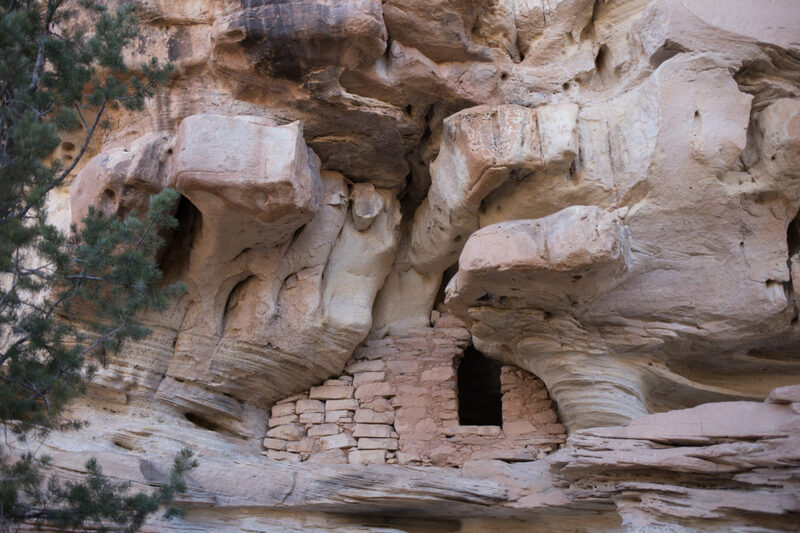 A cliff dwelling preserved for millennia by the dry high-desert climate was included in a March 20 lease sale for oil and gas companies in southeast Utah. Officials from the federal Bureau of Land Management published confidential information online about locations and descriptions of almost 900 Native American antiquities, including cliff dwellings, in Utah. Federal officials mistakenly published confidential information on locations and descriptions of about 900 ancient cliff dwellings, spiritual structures, rock art panels and other Native American antiquities in Utah. The Bureau of Land Management posted a 77-page report online that included unique identifiers for priceless artifacts as it prepared to auction the most archaeologically rich lands ever offered for industrial use. The report exposed ruins spanning 13,000 years of Native American history to vandalism and looting, and experts say the BLM violated federal regulations that prohibit publicly sharing information about antiquities. The document appeared on a BLM web page before the March oil and gas lease of 51,482 acres in a remote desert region of southeastern Utah. The BLM removed it and then reposted it with entire pages of detailed site descriptions blacked out. The report appeared online the last weekend in February and remained there for at least a few days – long enough for a state agency in Utah to download it and realize it violated the state’s privacy restrictions. Utah’s dry red rock wilderness has preserved ancient evidence of nomadic hunter-gatherers, farmers and tribes, including the Navajo, Ute and Hopi. Archaeologists in Utah have relied on BLM secrecy to protect dance circles sprinkled with shards of ancient black-on-white pottery, circular Navajo structures known as hogans and points for tools used by Paleoindians to hunt mammoths. The report’s appearance online unnerved Native Americans and scientists who provided the BLM with detailed reports and comments on antiquities with the understanding that they would be kept secret. Friends of Cedar Mesa Executive Director Josh Ewing looks at ancient ruins in Utah’s Montezuma Canyon, a culturally important site to Native Americans. After learning that the BLM posted a report briefly online exposing the locations and descriptions of hundreds of artifacts, Ewing said it caught him by surprise and that he’d never seen such details publicized before. In response to questions about how the confidential information ended up online, the BLM did not explain why the report was published. The agency “replaced the first report with (a) redacted copy of the report that removed the nature and location of archaeological sites to prevent looting and vandalism at these sites,” Nate Thomas, the BLM’s head archaeologist in Utah, said in an email to Reveal from The Center for Investigative Reporting. The BLM’s release of confidential information occurred as its understaffed field offices are under strain from an executive order issued by President Donald Trump last year to relieve the energy industry of “regulatory burdens.” A directive from the Department of Interior urged these offices to speed auctions of public lands by truncating scientific review and comment periods. Before the BLM discovered the publishing error, Reveal downloaded a copy of the unredacted review. Its existence hasn’t been reported until now. According to the report obtained by Reveal, the 43 parcels in Utah that the BLM auctioned to oil and gas companies contain 1,282 archaeological sites and likely hundreds of undiscovered ones. Of those, 899 were identified by a unique combination of numbers and letters known as a “Smithsonian trinomial,” which catalogs each relic or building by the state and county where it is located. The mistakenly released report didn’t include global positioning coordinates for those sites, but it did list them by parcel numbers that corresponded with maps published on the BLM’s website. It also contained proper names of archaeological sites, types of relics, numbers of sites on each parcel and the tribes that might have built them, which indicates their age. All of that was later redacted by the BLM. The release of the report is the latest controversy in an intensifying debate about how to protect the nation’s heritage as development and tourism explode across the West. 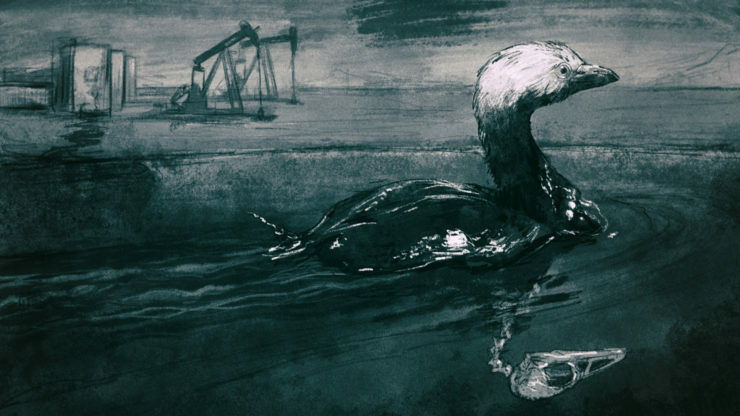 The BLM – which manages nearly 950 million surface and subsurface acres, primarily in 12 Western states – oversees leasing land to oil and gas companies. It’s required to ensure federal lands are available for multiple uses while also protecting cultural resources. These two responsibilities collided in the March 20 auction of lands in Utah. A Reveal investigation published in March found that the administration’s expedited move to open public lands to energy exploration puts at risk scores of ancient buildings, vessels, petroglyphs and roads. An analysis of hundreds of pages of federal documents, memos, protest letters and interviews showed the BLM expedited lease sales without analyzing all available cultural resource data. Under its regulations, the BLM must conduct environmental reviews and seek public comments before auctioning off federal land to the highest bidders. The agency also must make a “reasonable and good faith effort” to identify historic properties with the assistance of consulting parties and tribes, who say keeping the information they provide secret is paramount to protecting these sites. Looters download such information and sell it. Conservationists work feverishly to get it taken down. “The internet has changed everything – now there is widespread information on sites that were completely unknown two or three years ago,” said Diane Orr, co-chairman of the conservation committee for the Utah Rock Art Research Association, a consulting party on the BLM lease sale in Utah. 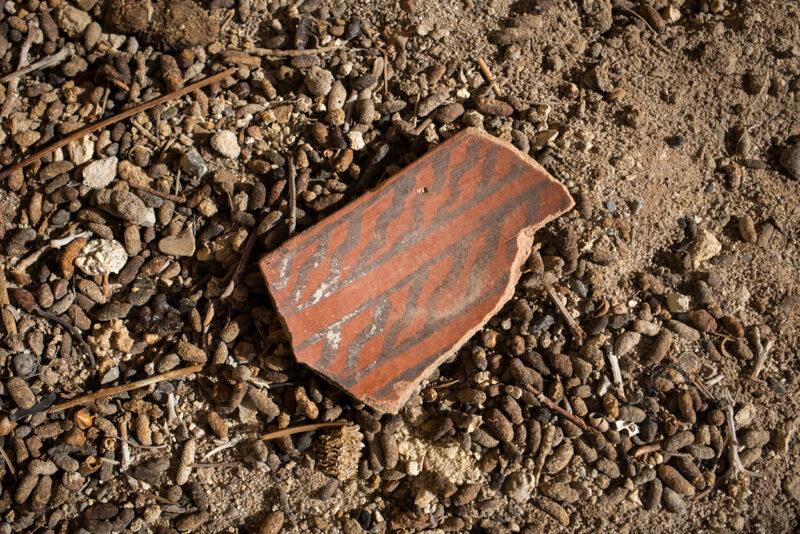 Pottery shard lies on the ground in southeast Utah. States protect their cultural resources differently. Utah tightly restricts access. Only qualified archaeologists can access these computer systems, after receiving credentials and signing a user’s agreement with Utah’s State Historic Preservation Office. Attorneys for conservation organizations said that several regulations require the federal government to keep such information confidential. “The law would prohibit publicly publishing site locations and site names,” said Laura Peterson, a staff attorney with the Southern Utah Wilderness Alliance, which was a consulting party on the March sale. Her organization and several other parties signed a memorandum of understanding with the BLM to protect such information. “When we filed a protest to this sale we had one version that was public and a second version that had more information we gave directly to archaeologists at the BLM because of confidentiality concerns,” she said. Little is understood about Ancient Puebloans, basketmakers and others who lived, worked, migrated and died on and near the auctioned lands. Several auctioned parcels are located near Hovenweep and Canyons of the Ancients national monuments. 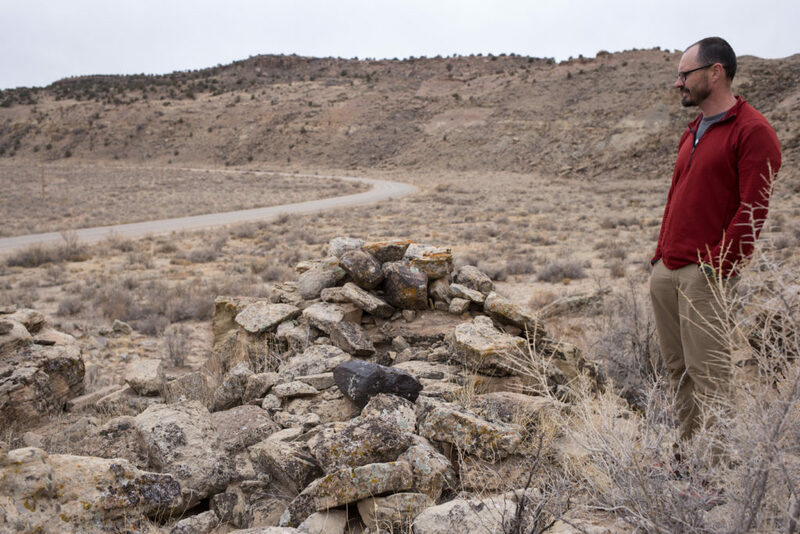 “There are thousands of undiscovered sites,” Hannah Russell, vice president of government affairs and research for the Utah Professional Archaeological Council, which was a consulting party to the March lease, said in an email to Reveal. Inventories exist for only 2 percent to 55 percent of the parcels the BLM auctioned in Utah’s Grand and San Juan counties. Using new technologies, scientists are beginning to understand connections between prehistoric peoples in southeastern Utah and other places in the Four Corners area. About 1,000 new archaeological sites were discovered in fiscal year 2017 alone on land the BLM oversees in Utah. Paradoxically, most of the sites in confidential state and BLM databases were discovered after developers or oil and gas companies hired archaeologists to survey areas prior to construction or drilling. President Donald Trump has pledged allegiance to what he calls America’s “energy dominance.” This is good news for the oil and gas industry. This story was edited by Marla Cone and copy edited by Nadia Wynter. Jennifer Oldham can be reached at jennoldham53@gmail.com. Follow her on Twitter: @jennoldham.